For a mature automotive enthusiast, finding a car to perfectly balance their practical needs and selfish wants can be a bit harrowing. The needs are high - it needs to accommodate the family, tackle the everyday commute and ideally be enjoyable to drive as well. The perfect car for such a person would be one that can comfortably carry the owner and family all week, and yet be fun to drive up a winding road on a weekend. And that's where the D-segment comes in. Or at least it did earlier. Over the past few years the segment has trickled down, with most of the market preference moving towards SUVs and premium hatchbacks. Hyundai, however, feels optimistic and has brought out the all-new Elantra to try and revive this segment. 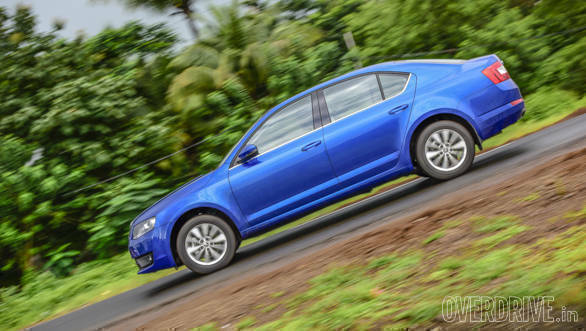 But can this diesel automatic turn around the fortunes of the entry premium sedan segment? 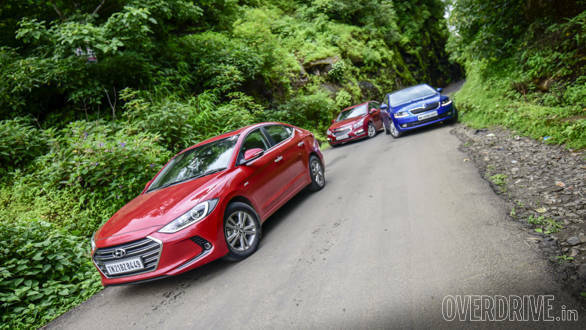 The previous-generation Elantra was a highly respected name, can it bring back the attention the segment desperately needs. 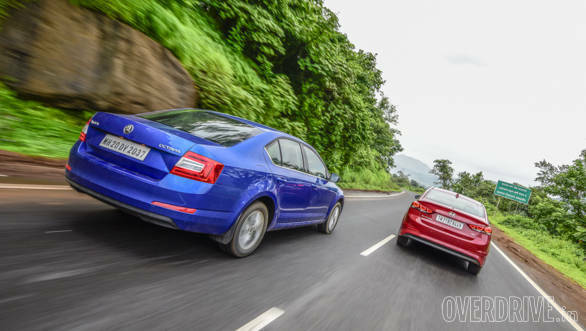 We pit it against two other sedans in the segment that are highly acclaimed cars but have faltered when it came to moving this segment forward, the Skoda Octavia and the Chevrolet Cruze. In this day and age where flamboyance is what the market is looking for, Hyundai has certainly nailed the Elantra's design! While the car's sleek silhouette has a neat curve with its coupe-like rear end, the sharp sculpted details at the front give the car a very aggressive stance. It even looks a bit European thanks to the sleek headlights, sharp sculpted bumper and the large hexagonal grille. In fact, I see quite a bit of Jaguar and Audi inspired design languages in there! (Ed: I think the new design is one of its failing. The previous-generation Elantra had a signature design language, inspirational in its own right, not inspired by anything which it no longer is). The DRLs, chrome trims and the piano black detailing on the bumper give the car a very modern and premium appeal. The rear too has a lot going on for it and is curvier the front. The top half of the bootlid, which resembles a lip spoiler, is a really nice touch, while the wide curve on the bumper accentuates how broad the car is. However, my favourite part has to be the beautiful LED detailing in the tail lights. I must admit, I found it very hard to take my eyes off while I was in one of the other cars! Step to the side and you'll notice how the sharper edges at the front gradually smooth out into the curved rear. But while the pinched end of the window line goes very well with the overall design, it throws the rear passenger's visibility out the window. Otherwise, the rear seat is quite comfortable and probably the best one here to accommodate three passengers abreast. 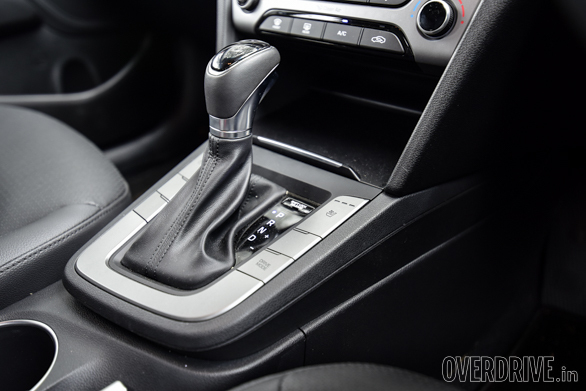 The rest of the all-black interior is built with quality materials and has a very modern and interesting design; on that it is quite different from all the other Hyundais. The driver-centric centre console meanwhile is certainly the most ergonomic here thanks to the large, well-placed buttons. In comparison, the Octavia's interior manages to offer a more premium feel with its wood trims, dual-tone finish and a simple symmetrical layout. While the buttons aren't as large or easy to use as the Elantra's, they are still easily accessible and not crammed too close to each other. The rear seat, although pretty comfortable, could have been a bit more reclined like in the Elantra. However, knee and shoulder room are the best in this test. Despite that, it's ideal for just two passengers because of the high transmission tunnel that intrudes into the passenger space. The Octavia, however, easily has the biggest boot. Like the interior, the Octavia looks very upmarket from the outside with its sharp edges and straight lines. While it doesn't look as flamboyant or as interesting as the Elantra, it still is very handsome and hasn't aged much. In fact, it's a bit hard to believe that this design came out three years ago! The overall design is a lot simpler, with the neat creases and the minimal usage of chrome, which is a typical European characteristic. On the other end of the spectrum, we have the Cruze, which has a little too much chrome for my liking. While its design isn't necessarily bad, it has gotten rather old after all these years. While the front and rear have interesting details like the large split grille and the integrated lip spoiler, the Cruze's side profile simply looks too bland. Although Chevrolet has tried to keep things interesting over the years with minimal additions like new bumpers with chrome garnishing and LED DRLs, they all unfortunately look like an aftermarket installation rather than an OEM fitment. It's the same case with the Cruze's interior. Although the overall layout itself isn't bordering on bland, the quality of materials used is quite disappointing and the controls aren't as well spaced out or as neatly laid out as in the others. While Chevy has recently included a new 7-inch touchscreen system to keep up with the times, the unit is awkwardly placed a bit deep inside the panel, making accessibility cumbersome. The amount of space in the Cruze is no longer as competitive. It offers the least cabin room, and the dark interior theme makes it feel even smaller than it is. 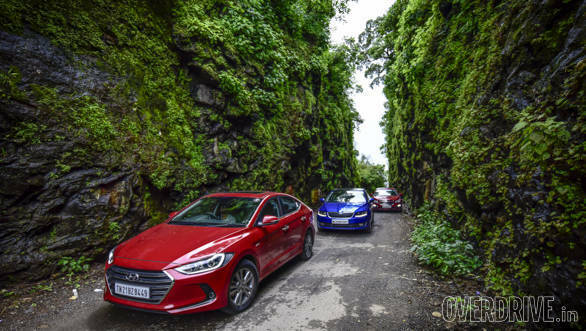 Although everything aesthetic about the Elantra is new, it still runs the same 1.6-litre turbocharged diesel engine, which makes 128PS of power at 4,000rpm and 260Nm of torque between 1,900-2,750rpm. This is the same engine also seen in the Verna and Creta, and comes with a conventional 6-speed automatic gearbox. 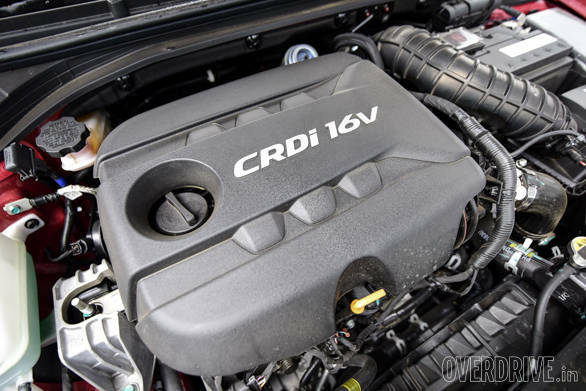 The motor is the most refined one here with impressive NVH levels. It's quite responsive too with good throttle sensitivity. Although power delivery is very linear, the sensitive throttle does take some getting used to in stop-and-go traffic conditions. The gearbox is also quite responsive and delivers downshifts quickly, while up shifts are very smooth. The Elantra offers three driving modes  Normal, Eco and Sport. 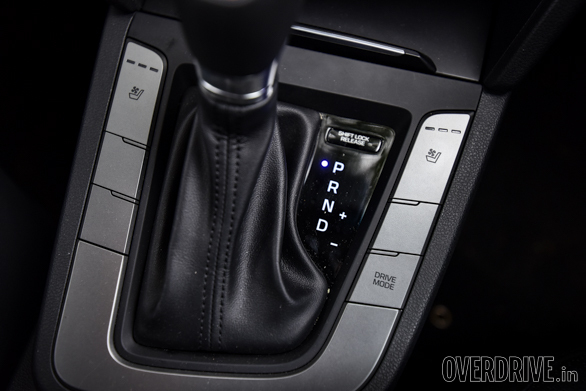 While the later's shift points are evident in Sport mode, there isn't a noticeable difference in throttle sensitivity or engine response among the three modes. While the engine works very well within the city, its weaknesses are evident on the highway. Sure, the car can comfortably keep a steady highway cruising pace, but the engine feels more strained than the other two at higher speeds. It's also the slowest car here and managed to get from 0-100kmph in 11.5 seconds. 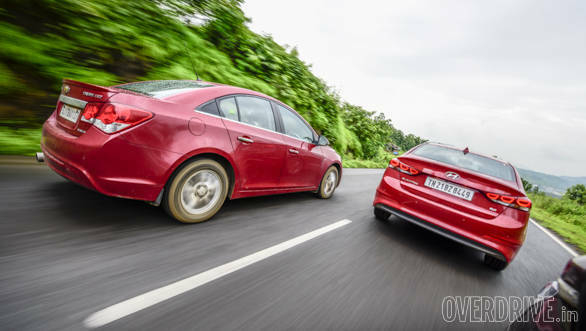 In comparison, the Octavia is the quickest here with 8.7 seconds on the clock, while the Cruze manages the same in a respectable 9.4 seconds. Essentially, the Elantra's engine doesn't deliver the kind of oomph you'd expect from a car in this segment. 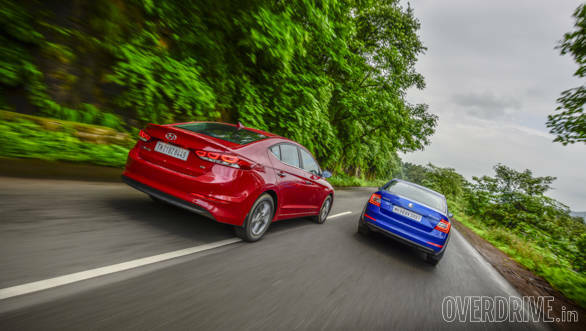 Of course, a smaller engine would usually translate to better efficiency, and the Elantra did return a good 15.9kmpl in the city and19.2kmpl on the highway. But the Octavia, with a larger and more powerful engine, still managed to return similar numbers  15.9kmpl in the city and 19.5kmpl on the highway. The Octavia has a very responsive 2.0-litre turbocharged diesel, which produces a healthy 143PS of power at 4,000rpm and significantly higher torque of 320Nm right from 1,750-3,000rpm. The linear power delivery along with that lovely 6-speed dual-clutch transmission makes the Octavia a real charmer on the road. The engine is barely strained at high speeds and just doesn't seem to run out of breath. So while the engine is a bit louder than the Elantra's at idle and lower revs, it remains calm at higher speeds. In fact, it's the Octavia's transmission that makes all the difference. The unit is smooth and super quick to offer downshifts under braking. It's the reason why the Octavia offers the best fuel efficiency and the best performance despite the power disadvantage to the Cruze. The icing on the cake though has to be the paddle shifters. I don't know about you, but paddle shifters on a responsive gearbox go a long way in increasing the fun quotient in a car for me. However, for a lot of people, it's the Cruze's power figure that gets them excited. The availability of 360Nm of torque and 166PS of power on tap is certainly an impressive factor, but that's just on paper. 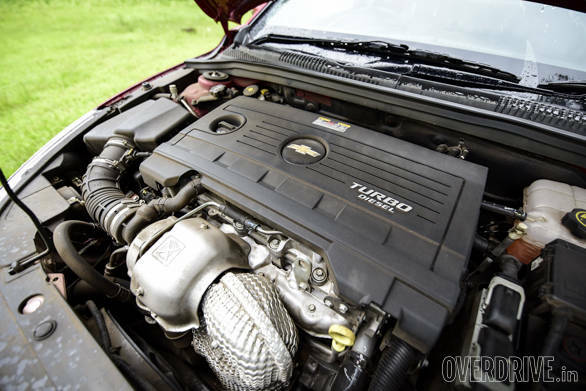 In the real world, the Cruze's 2.0-litre turbo diesel isn't the most likeable one here. Compared to the other two cars, its engine is neither as refined nor as responsive. Until 2,000rpm, there's a significant amount of lag, and then there's just lot of wheelspin and torque steer till the car regains its composure in the lower gears. The 6-speed torque converter, while not bad, is the least responsive one here as well. 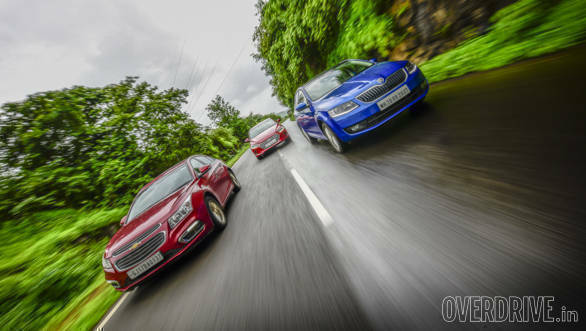 The Cruze really shows its mettle on a long straight road where it effortlessly picks up speed. However, with all that power and the relatively outdated gearbox, efficiency takes a big hit. 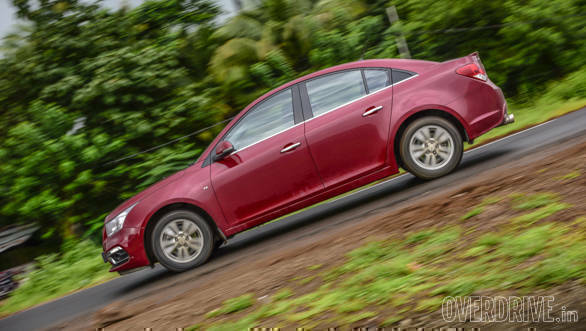 The Cruze returned just 8.9kmpl in the city and 11.96kmpl on the highway. Where the Elantra trumps its competition is ride quality. The suspension and damping is set up to absorb both large and small potholes very impressively. I barely slowed down over the broken roads within the city and yet none of the thuds were transferred into the cabin. Even over the larger undulations on the highway, the car was composed and didn't feel overly jumpy. However, while there isn't too much body roll, the rear suspension tends to get a bit bouncy at high corner speeds. This was a tendency the old Elantra displayed quite strongly and the new one offers much better high-speed behaviour. On the other hand, the Cruze has a far more progressive braking system. The steering, however, feels comparatively heavy and harder to use in traffic, but offers a decent amount of feedback on the highway unlike the Elantra. Unfortunately, there aren't too many other saving graces for it in terms of handling. The soft suspension results in comparatively higher amounts of body roll, and the 205/60 section JK Vectra tyres are not up to the job of handling all that power. Push too hard and the Cruze understeers quite easily. This is the only car here without ESP, and with those tyres and that much torque it needs it the most. Low-speed ride quality is also a weak point, and the Cruze thuds over the same imperfections that the other two comfortably soak up. It's Skoda that's managed to find the right balance between ride and handling. While the suspension is a bit firmer than the Elantra's, the ride quality is still damn near as good. And that makes a noticeable difference in the Octavia's dynamics. It feels a lot more planted around a curve than the Elantra, and the steering offers better feedback too. And like the Hyundai, the steering gets lighter at slow city speeds making it very convenient around town. The brakes are easily the best in this test, have good initial bite and assure you that it will stop no matter what. Essentially, the Octavia is the best driver's car over here and it does so without compromising on ride quality. In terms of features, the Octavia and Elantra can throw punches at each other all day. While it's the fully loaded Octavia that gets Bi-xenon headlights, cornering fog lamps, automatically dimming ORVMs with a defoggers and front parking sensors, the top-spec Elantra SX (O) features ventilated seats, projector fog lamps and a smart trunk. The last one is quite handy especially when your hands are full and can't access the boot. If the key is in your pocket, you just have to walk up to the rear of the car, and it automatically opens the bootlid. 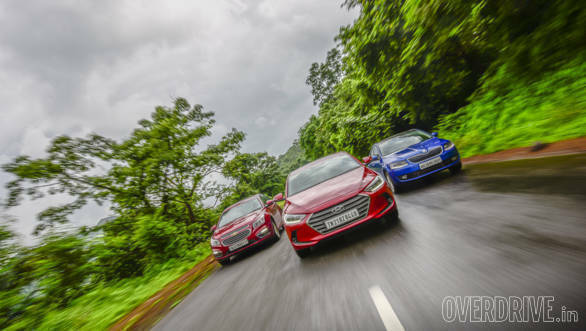 The Cruze on the other hand feels comparatively outdated and doesn't get dual-zone climate control, auto-headlamps or even projector headlights like the other two. However, it does get projector fog lamps, unlike the Octavia, and rain-sensing wipers, which the Elantra loses out on. 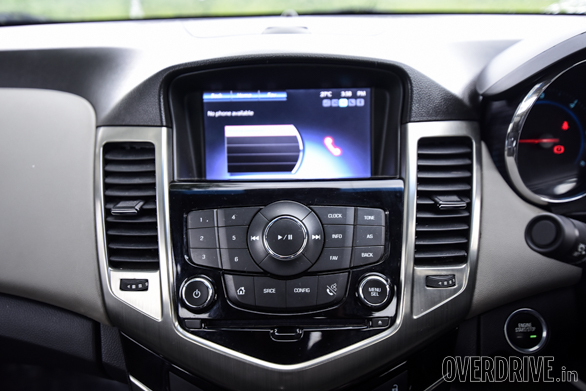 It also gets a 7-inch touchscreen infotainment system which is integrated to Chevy's MyLink interface. While the interface itself isn't too complicated to understand, the unit's awkward positioning and the unavailability of Android Auto and Apple CarPlay make it my least favourite here. 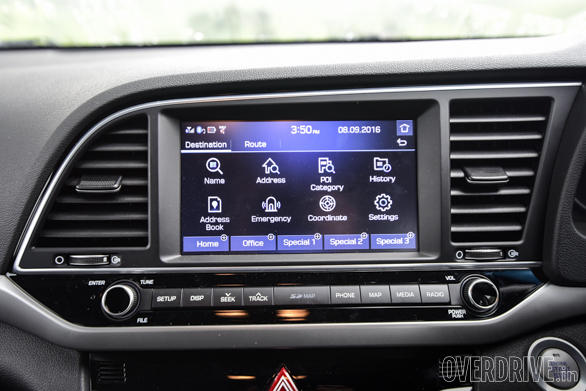 In comparison, the 8-inch touchscreen unit in the Elantra is easier to understand, and supports Android Auto and Apple CarPlay. 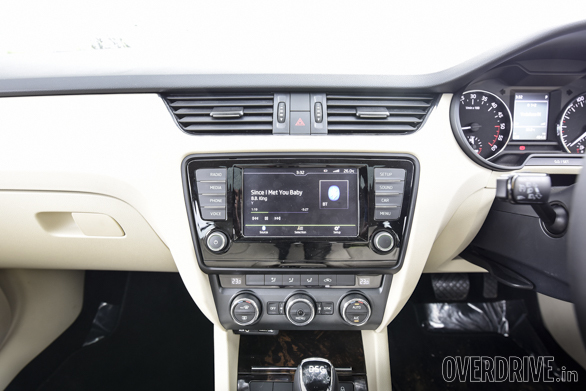 The Octavia gets the smallest touchscreen unit here measuring 6.5 inches but still offers good resolution. In addition to Android Auto and Apple CarPlay, it supports MirrorLink. MirrorLink, as the name suggests, reflects exactly what's on your phone onto the infotainment unit. With respect to safety, the Octavia comes out on top with electronic brake distribution and traction control as standard across the range. Features like ESC and multi-collision brake (which automatically hits the brakes upon impact to prevent any further accidents) are available only on the mid-spec Ambition Plus and the top-of-the-line Style Plus variants. However, it's the Style Plus which gets eight airbags while the other two get four. The Elantra stands at second and also gets six airbags, ESP, ABS and EBD on the top-of-the-line SX (O) AT variant. However, only front airbags, ABS and EBD are standard across the range. ESP on the other hand is available only in the manual and automatic SX (O) variants. The Cruze again disappoints here because Chevrolet hasn't updated its safety equipment after all these years. Despite having the most powerful engine here, it doesn't have ESP or traction control. 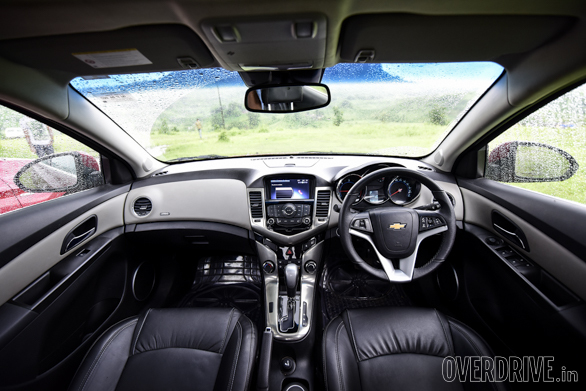 It also features only four airbags in the top-spec LTZ trim, while the base LT variant gets dual airbags as standard. However, ABS and EBD are standard on both trims. Interestingly enough, none of the cars here seem to offer that perfect package that one would be looking for. The Cruze sounds like a great car on paper. A D-segment diesel automatic with 166PS and 360Nm for just Rs 20.67 lakh on-road in Delhi sounds like quite a bargain compared to the other two. However, in the real world, that much money is a lot for a car that isn't as modern, efficient or comfortable as the other two. The Octavia on the other hand easily sounds like the best car on test. It comes closest to being the perfect package with its timeless design, excellent quality, extensive feature list and great drivability. But where it suffers a huge loss is in its very steep asking price of Rs 26.3 lakh. While it does have a larger engine than the Elantra and a more advanced gearbox, it is still a huge price to ask. Even the second highest model, the Ambition Plus, is almost Rs 1.25 lakh more than Elantra, and it loses out on some important features like side and curtain airbags, a sunroof and a keyless entry/start-stop system. 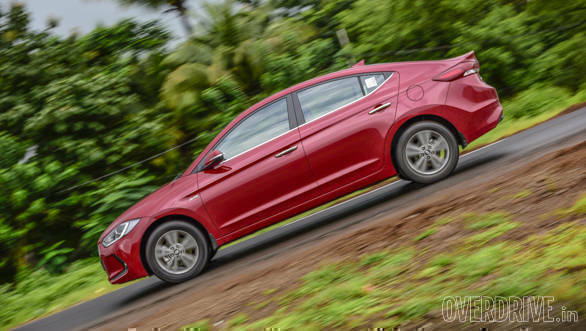 The Elantra, on the other hand, makes for a very compelling purchase at Rs 22.73 lakh. It looks great, offers all the latest features and is quite practical. Thanks to the sublime ride quality, it's also the most comfortable to be driven around in despite not offering as much rear knee room as the Octavia. Not to mention Hyundai's larger service network and lower cost of ownership. If the Octavia was priced closer to the Elantra, it would have been an easy win but this price gap is simply too big to ignore. If you love driving and can afford the price tag, the Octavia is the one to have. However, we have to give the win to the Hyundai for offering a great package at a reasonable price. It's the best deal here!